In my posts on 3rd March 3 and 11/26th August 2015 we saw how Patrick Concar from Co. Roscommon was among a group of seasonal harvesters who, in 1845, were caught bringing guns back to Ireland from Staffordshire. He somehow escaped imprisonment and when the Famine struck he was forced to settle back in Stafford, the area he already knew. He was not alone. At least three Concar family members came to the town but today’s surviving line is descended from the partnership Patrick established after his arrival. The second generation of Concars were all born in and grew up in Stafford. Their lives were often problematic, but by the end of the nineteenth century the family had become part of the Stafford working class. In 1851 Patrick was a labourer working at Tillington Farm on the northern outskirts of the town, whilst his brother William had arrived and was nearby at Creswell Farm. In the 1850s their brother Martin also came to the Stafford area with his son Edward. William and Martin did not ultimately settle, but Edward stayed on, doing farmwork and labouring until his death in 1891. He never married. On 2nd October 1854 Patrick Concar married Bridget Kenny at St Austins Church. She is not recorded in Stafford before her marriage to Patrick. He perhaps already knew her from home, but equally he may have met her in the lodging houses of Stafford. Their union was one of a wave of marriages that occurred amongst young exiles from the Famine struggling to rebuild their lives. The newly-married couple settled in New Street in Stafford’s north end and the family continued to live there until Bridget’s death in 1898. They began at No. 47A. They were forced to take lodgers to pay the rent but they were not running a lodging house. In 1861 another Irish family, the Burkes, was sharing the dwelling with them. Later in the 1860s they moved to No. 61 New Street and they lived in that house for over thirty years. It was one of the smallest and most miserable dwellings in the street, and across the back yard lay Startin’s Court, an unsavoury group of three even smaller cottages. The row of houses from 61 to 69 was wholly occupied by Irish families and their descendants. Even so, it was by no means a ghetto. English neighbours lived at no. 59 next door to the Concars, whilst all the houses opposite – less than twenty feet away – were occupied by English families. New Street where the Concars lived. 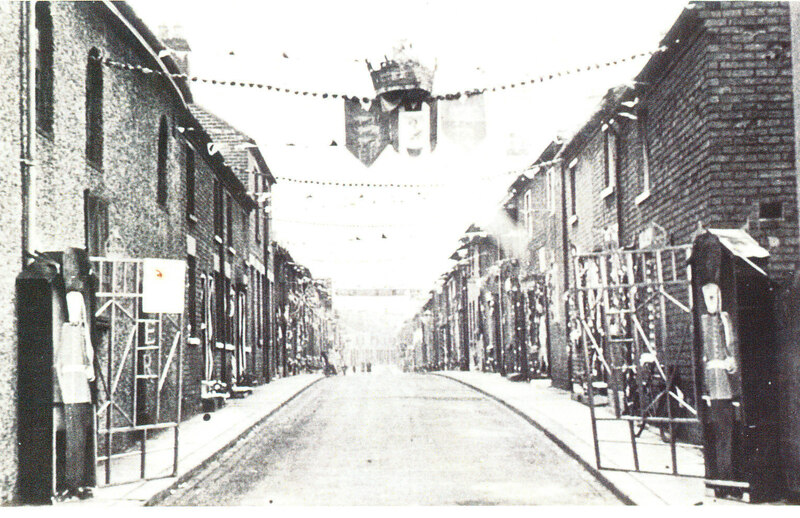 The photo was taken during the Coronation celebrations, 1953 (courtesy of the late Roy Mitchell). The Concars lived in one of the houses on the left in the middle distance. It seems that Patrick and Bridget did their best to make No. 61 New Street a stable and decent home. Although they were living in modest circumstances, they began a process of direct involvement with Stafford life – they did not remain ‘outcasts’ from it. Children started to arrive and in the early years work, home and domestic life must have been the focus of their existence. There is no record of their doings before 1868. This negative evidence suggests they steered clear of trouble and, in particular, largely avoided the drunken disorder common in nearby Snow’s Yard. Patrick got the vote under the franchise reform of 1867 and in 1868/9 he voted Liberal both times. The two elections of 1868/9 saw Stafford’s usual outbreak of bribery, intimidation and violence and Patrick was amongst many from the mob who found themselves in the magistrates’ court – no great crime in the run of Stafford’s elections! His activities show he engaged with politics, though the fact that the dominant election issue was the disestablishment of the (Protestant) Church of Ireland also suggests Patrick’s continuing attachment to his homeland and to Irish causes. By 1872 the Concars had nine children. They were growing up in the heart of Stafford’s working-class north end, and once they reached their teenage years they started to get into the sort of scrapes common at that age. In September 1872 Thomas, the first-born (1857), was arrested for being drunk and disturbing the peace in Foregate Street. It was said that he was supplied with drink by some Irish labourers from Red Cow Yard at a house in New Street. The newspaper reported that Thomas was ‘a decent-looking Irish boy’. During this period the Staffordshire Advertiser often referred to ‘Irish Rows’ and identified specific individuals as Irish. Although the paper did not go beyond this to explicit anti-Irish hostility, the steady drip of ethnic labeling must have contributed to the stigmatization of working-class families of Irish origin. In Thomas Concar’s case this Stafford-born lad was branded as ‘Irish’ by his parents’ origin, by where he lived and the company he kept. We can see why aspirant Irish families sought respectability by avoiding areas and associations that would lead to such stigmatization. The Concar family’s life changed radically in 1874. With the decline in farmwork in the late 1860s, Patrick was forced to shift jobs. He became a general labourer and got a job on the railway. In May 1874 he was working on the main line tracks to Crewe at Madeley station north of Stafford and was run down and killed by a train. Bridget Concar suddenly had to support her extensive family on her own. With no father at home, the teenage children got into further trouble and life at No. 61 became stressed and difficult. Less than a year after Patrick’s death his son Martin (b. 1859), described as ‘a disreputable-looking youth from New Street’, was in court for assaulting ‘a little girl’ named Elizabeth Reddish. No details were given but it was probably some sort of sexual assault. Even so, Martin got away with just a 5s. fine or 14 days in prison for the offence. It was, nevertheless, a portent of further trouble. In the next three years Martin was imprisoned twice for theft and also had a conviction for drunkenness. In the 1880s Martin went the way of many a poor youth and joined the army, but by 1887 he was back in Stafford. In that year he married Julia Simpson, the daughter of a Staffordian shoemaker and a Protestant. Marriage did not tame Martin Concar. In 1888 he was in court again for drunkenness, assault and theft. The end was near, however. The couple managed to have one child, Thomas (b. 1888), but Martin died in 1890 after less than three years of marriage. Julia and Thomas were forced to go back to her parents in Sash Street, and in 1892 she married Charles Bates, a local shoemaker. Thomas was brought up in the new household as his stepson but he kept the name Concar and went on to found an extensive line of the Concar family that is still represented in the area today. This demonstrates how a family’s thread of life can be stretched very thin but still survive and prosper. In the next post we shall see what happened to the Concar family in the long term. A Kenny family settled in Stafford in the 1860s and it does seem to have originated in the Galway/Mayo/Roscommon area. It is impossible to say whether Bridget Kenney came from the same family, but it seems likely, and it might explain why the later Kenny household came to Stafford from East Anglia. Staffordshire Advertiser, (SA), 9 January 1869 et seq. The newspaper refers to a ‘Michael’ Concar, but there was never a person in Stafford recorded by that name. The evidence points to Patrick and the two names are a common combination. SA, 7 September 1872. The report said he was supplied with drink from the Red Cow Inn, but a week later the paper corrected this to ‘Red Cow Lane’. Information given by Ken and Steven Hewitt, interviewed June 2003. In my post on 26 August 2015 I looked at the ways Irish people dealt with the terrible conditions in the Castlerea area of mid-west Ireland in the decades before the Famine. This post looks at what attracted some of these people to the Stafford area, not just in the pre-Famine times but throughout the nineteenth century. Why was this obscure town in the English west Midlands generally a good place to go? First, we first need to look at the countryside surrounding Stafford. 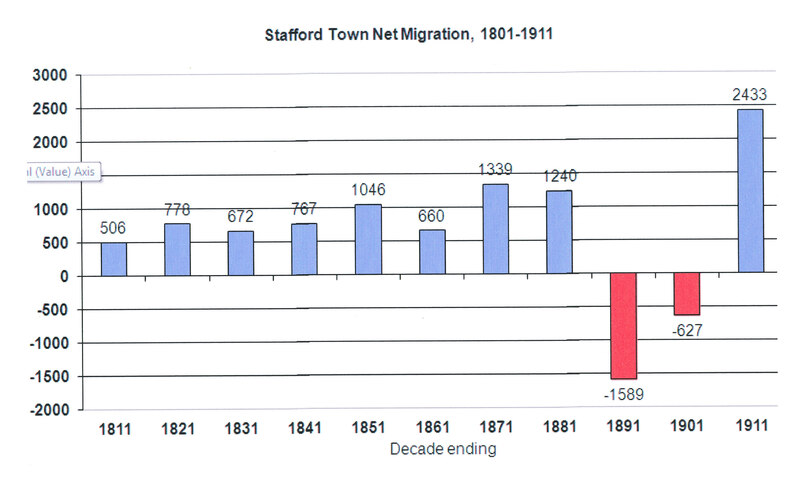 In the 1820s the area about five miles radius around Stafford town contained a scattered population of 6,500 and the numbers were more or less stagnant. People were leaving the land to get better paid work in the towns – Stafford, the Potteries and the Black Country. That remained true throughout the nineteenth century. The graph shows the estimated net migration – the balance between those coming into the rural area and those leaving – from 1801 to 1911. In all but one decade more left than came in. In the 1830s nearly 600 more people left than settled and the out-migration peaked at over 1100 in the 1860s. It remained high for the rest of the period. That does not mean the rural economy was in decline – far from it. Although Staffordshire suffered a farming depression after the Napoleonic wars, it was relatively less affected than other parts of the country because of demand from growing towns close by. Local landowners and tenant farmers did pretty well in the nineteenth century. The district had lots of mixed farms and getting in the hay and grain harvests were events of the farm year. It was the need for extra labour to do these jobs that forged the link with Irish workers from the Castlerea area in the 1820s. Seasonal migration to work on the farms continued during and after the Famine. Indeed, it strengthened. Many local labourers were leaving the land and farmers were faced with an incipient labour shortage during the “High Farming” boom in the mid-century. It opened up opportunities for the Irish, not just in terms of extra seasonal work but also in more permanent jobs throughout the year. The Irish continued to come in large numbers right up until the late 1860s. Some of them settled in the countryside permanently, but most tramped out to their work from the slums of Stafford. After 1865 increasing farm mechanisation started to destroy these jobs, however. It was a case of ‘last in, first out’ and that meant the Irish became redundant. Although some seasonal Irish workers continued to come to the district area, farmwork ceased to be much of a draw. Stafford town was, however, a dynamic place in the nineteenth century. Its population quadrupled between 1801 and 1881 and the graph shows part of the reason why. Immigrants were continually attracted in by the promise of jobs, and that included the Irish. Although the boom slowed in the 1880s and 1890s and there was a net outflow for a time, there was another inward surge in Edwardian times. 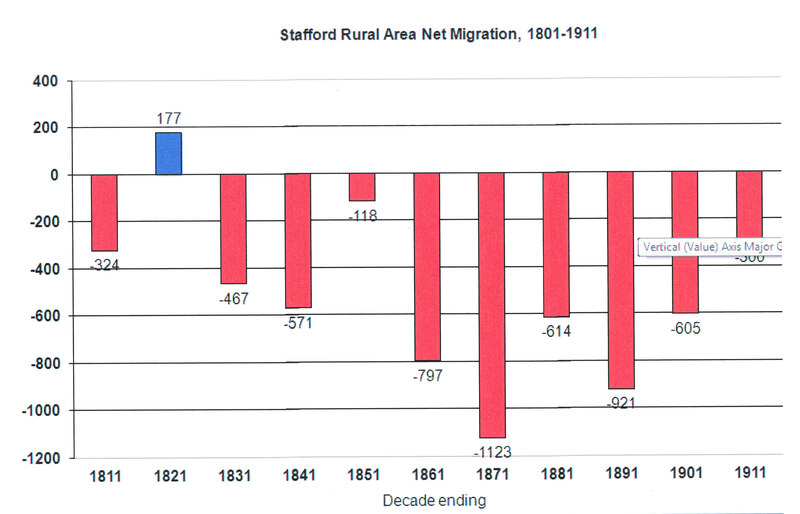 By 1911 Stafford’s population was six times that in 1801. Its economic performance was well above the average for England and Wales as a whole, and although it did not match the explosive growth of Stoke-on-Trent or Wolverhampton its strongly expanding economy put it amongst the ancient towns that adapted successfully to the industrial age. A number of factors contributed to Stafford’s dynamic performance and attracted Irish migrants. Firstly, its role as the market town for the surrounding agricultural area was strengthened by the general prosperity of local farming. The town’s outdoor, indoor and agricultural markets expanded. The cattle fairs attracted Irish dealers and drovers, a further point of contact with rural Ireland. The Irishman Joseph Lyons and his wife Mary arrived in Stafford in the early 1860s and his family ran a fish stall in the market for over twenty years. He was clearly a “rogue trader”, charged at various times with selling bad fish, assault and various market rules offences. The nineteenth century also saw the emergence of modern lock-up shops such as Mottrams. They took over the clothing business of another Irishman, John Crosbie from Ulster, when he went bankrupt in 1878. Another of Stafford’s Ulster Irish, Hugh Gibson, was a promoter of the Stafford Mutual Permanent Benefit Building Society amongst his many business and political activities. The expansion of Stafford’s service functions therefore meant there were more jobs in shops, warehousing, cartage, refuse disposal and so on which opened up opportunities for the Irish. Their desperate need for housing was met by numerous Irish lodging house keepers about the town. The general expansion of Stafford meant more or less continual activity in building and construction. The building trade employed around 15 per cent of the male workforce, many of them Irish. Some farmworkers switched to building work when the number of jobs on the land declined in the late 1860s. A second factor contributing to Stafford’s dynamic performance in the nineteenth century was its strategic location in the transport network. The arrival of the railway in 1837 was fundamental. Irish navvies worked on the railway’s construction but none stayed in Stafford afterwards; they moved on up the line and on to the next project. But Stafford now lay on the new trunk railway network and as traffic built up the station, engine sheds, goods facilities and signalling systems expanded. The number of railway jobs grew and by 1901 nearly a thousand people worked on the railway. Down the years a significant number of them were Irish. Stafford’s key industry was, of course, the manufacture of boots and shoes. I shall do a special post on the shoe trade and Ireland at a later date but here I just want to emphasise how rapidly it grew in the nineteenth century. As a craft, although often a sweated one, the shoe trade directly attracted Irish workers who already had the necessary skills. There was a long tradition of shoemakers going “on tramp” to seek work, and to a great extent Britain and Ireland formed a unified labour market. Irish shoemakers attracted to Stafford, for example, were Protestants like the Andrew Brew or Hugh Gibson and Catholics like John Gavan, John O’Connor and John Mulrooney. There was no work in the shoe trade for the unskilled labouring Irish, but it did provide openings for their children who grew up in the town. After 1874 the shoe trade ran into problems caused by overseas competition but this proved to be Stafford’s only major setback in the nineteenth century. Although the town became relatively less attractive to the Irish, the manufacturing economy began to diversify with the growth of firms like Dorman’s engineering factory, Bagnall’s locomotive works and Rooper’s artificial grindstone business (later the Universal). The biggest development was the opening in 1903 of the Siemens dynamo works which helped restore Stafford’s economic dynamism in the 1900s. Many of the children of Irish immigrants found work in these new industries as well as in the shoe trade. The growth of public services and institutions also attracted some Irish to Stafford. Municipal reform forced the reluctant council to shoulder more responsibilities and employ more workers. The gasworks was bought by the council in 1878 and was a source of both labouring and clerical jobs. The borough police force was established in 1836, and the county force in 1842. Irish men worked in both. Education reform also created jobs, particularly for women, and both immigrants and second generation Irish children went into the teaching profession. In 1874 the first Medical Officer of Health, a Protestant Irishman, was appointed and for ten years he vigorously pursued the public health reforms needed in this “stinking” town. The new waterworks, sewage works and other services created labouring, technical and clerical jobs in the public sector. Stafford also had its four major public institutions – the Infirmary, the County Lunatic Asylum, the Coton Hill Asylum and Stafford Gaol. Each provided jobs open, in various ways, to Irish immigrants and their children. Between 1852 and 1882 Stafford was also the base of the 2nd Staffordshire Militia, and down the years many Irish regular soldiers were drafted to the Militia barracks. A significant number settled in the town and formed a distinctive but varied element amongst its Irish families. John Cronin in my last post was one of these. The Irish who came to Stafford in the nineteenth century were therefore attracted by many different things. There was no single and simple reason for their settlement. In the end, however, they had to get work to live, and it was the jobs created by the diversity and dynamism of the town’s economy that attracted many of the immigrants, just as they continued to do in much of the twentieth century. If you want to know how I worked out these net migration figures, please get in touch. M.W. Greenslade and D.A. Johnston (eds. ), A History of the County of Stafford, Vol. VI, (Oxford, OUP for the Institute of Historical Research, 1979), p. 91. For example, see Staffordshire Advertiser, 21 April 1864, 28 April 1866, 15 February 1868, 16 December 1871, 3 May 1873, 29 June 1878. The history of the mixed ethnicity Cronin family is relatively simple in comparison with that of other Irish families in Stafford. Although they were partly an army family their origins in Stafford were, nevertheless, somewhat more complex. In the period before 1920 the Cronins integrated into local society but ultimately they died out completely and today there are no descendants from this family left in Stafford. John Cronin was posted to Stafford Militia Barracks as a Staff Sergeant around the beginning of 1862. His story was very different from that of the sad John Ryan that I described in my post on 10 July 2015. Cronin made a success of life in Stafford and members of his family were present in the town for over 130 years. The family retained, and indeed promoted, a strong identification with Catholicism but their ethnic Irish identity was rapidly transmuted into an English Catholic one. That process began with John Cronin’s career in the army, was enhanced by his marriage and confirmed by the family’s evolution in Stafford. The story of the Cronin family in Stafford does not begin with John Cronin but back in the 1830s with a railwayman, Robert Moyers. Moyers was a porter at Stafford station, having started there when the Grand Junction railway line was opened in 1837 or shortly thereafter. He had been born in Ireland between 1804 and 1811, but we do not know where he came from. The most likely places are either the Cashel area of Co. Tipperary, Rathfarnham near Dublin or Strokestown, Co. Roscommon, all home to extensive families with that rather uncommon name. Moyers was a Catholic and he had not been long in Stafford before, in 1841, he married a local Catholic woman, Susannah Follows. She was a servant from a humble family which had moved into Stafford from Bednall, four miles south of the town. The marriage was one of social equals. Even so, with his job on the railway, Robert and Susannah could aspire to modest security. They had four children in the 1840s, and in 1851 were living in a small house in Mill Bank, five minutes’ walk from the station. Two of Susannah’s young relatives, Charles and Susan Follows were also living with them, the former listed as a solicitor’s writing clerk though he was only thirteen. It suggests an aspirant household determined to do well. Unfortunately, Robert died in 1854, aged only forty-eight, and the family struggled before the children started earning. Even so, their commitment to Catholicism and St Austin’s Church provided them with both spiritual and material sustenance from the clergy and more prosperous members of the mission. Their eldest child, Susannah, rose from her humble origins, went into the Church and became a nun. The Moyers’s second child was Elizabeth (b. 1844), and it was she who, in 1867, married John Cronin. We now turn to look at his life beforehand. John Cronin was born in 1824 in the parish of Ballymodan, Co. Cork. That parish included the town of Bandon and he probably lived in the town because his occupation was described as a tailor when he enlisted in the army on 29 August 1840. The evidence suggests he came from a modest but aspirant artisanal family and had had a reasonable education. Joining up in the city of Cork, he was attached to the 68th Regiment of Foot and served in Ireland, Malta, Guinea, the Ionian Islands and the Burmese Wars and also in the Crimean War. He had worked his way up from Private to Sergeant by 1847 and was promoted to Colour Sergeant, the highest non-commissioned rank, in 1857. Finally discharged at the garrison town of Fermoy, Co. Cork, on 26 November 1861, Cronin had served over twenty-one years in the army. He therefore qualified for a full pension. John Cronin was a model soldier. His record was described as ‘extremely good,’ he never faced a court martial and he received a gratuity and a number of good conduct medals during his service. To achieve such a record he had to embrace publicly the identity and ethos of the British Army in its imperial roles. His subsequent history suggests he internalised those values as well. He made no attempt to return to his home town after discharge but immediately enlisted for militia duty and was sent as Staff Sergeant to Stafford. He arrived in the town as an eligible man in his late thirties. We know nothing specific of his first few years in Stafford but that silence suggests he carried out his duties as orderly room clerk quietly and diligently. It was vital clerical experience that would bring him benefits. The Barracks backed on to St Austin’s Church and John Cronin could be at Mass within two minutes. He was a regular communicant and got to know others in the congregation. Amongst the people walking past the Barracks on their way to St Austin’s were Susannah Moyers and her children. At that time they were living just down the road in Middle Friars and they would have been pointed out as a devout and respectable family. At some point Cronin was introduced to Elizabeth Moyers who was then around twenty years of age. She was helping the family income by working as a dressmaker, a job with few prospects. Despite their age difference, the smart and eligible John Cronin was a good catch and they married at St Austin’s on 30 November 1867. The Cronins set up home initially at No. 15 Queen Street in the town centre. Elizabeth’s widowed mother Susannah was living with them in 1871 but she died in 1874. Around this time the family moved back near the Barracks in Forebridge and in 1881 they lived at No. 4 Friar’s Terrace, a house they were to occupy for more than thirty years. It was a solid terraced property with a garden and a pleasant view across open ground to the playing field of King Edward’s School. It was, furthermore, just a minute away from the Barracks. Cronin’s time in the Militia was coming to an end, but his subsequent activities demonstrate how service personnel with contacts, a good record and a respectful demeanour could find new opportunities in civilian life. In 1874 the Stafford Urban Sanitary Authority was being established as a result of the Public Health Act of 1872. A collector of rates was needed and John Cronin applied. He was one of two short-listed applicants and his proposed appointment was seconded by Alderman Hugh Gibson, an Ulster Presbyterian who had already served one term as Stafford’s Mayor. Gibson’s backing of the Catholic applicant demonstrates the esteem with which Cronin was already held but also the apparent lack of sectarianism amongst Stafford’s elite. Cronin received ‘flattering testimonials’ from his Militia sponsors but the Authority members voted for a local man by eight votes to the seven cast for Cronin. The following year he tried again and succeeded, being appointed collector of the Watch Rate. He subsequently also became collector of the district general rate when the 1875 Public Health Act was implemented. He held these posts until shortly before his death, at which time it was said, rather ungrammatically, that his ‘urbanity of manner and kindliness rendered a difficult post as little unpleasant as possible’. He collected around £100,000 in his time in the job. From their modest origins the Cronins were now moving into respectable Stafford society, but the focus of their social life remained St Austin’s Church and School. Elizabeth Cronin was involved in the School’s amateur dramatics, and as the children grew up they could attend social gatherings such as soirées more frequently. John Cronin was involved in the St Vincent de Paul Society. The ultimate problem for Elizabeth Cronin was, of course, that her husband was twenty years older than her and always likely to die first. John passed away in April 1889 at the age of sixty-five, and his funeral demonstrated the respect in which the family was then held. His coffin was followed to the grave by old Militia comrades and there were representatives from the Borough Council, the SVP and, doubtless, many from St Austin’s congregation. The home created at Friar’s Terrace by Elizabeth and John Cronin was a classic of respectable Victoriana. The couple had five surviving children, and their history indicates a quasi-Irish family that integrated smoothly into British life. It also demonstrates, however, how a family may ultimately die out completely. The Cronin’s first child, Francis, was born in 1868. He did well enough at school and began work as a clerk. He decided, however, to follow in his father’s footsteps and on 2 September 1884, when he was sixteen, he enlisted with the Durham Light Infantry. His army career was as exemplary as his father’s and by 1896 he had reached the rank of sergeant. At that point he re-engaged as a clerk with the Medical Staff Corps and was ultimately discharged with the rank of sergeant-major in February 1906. He had completed his twenty-one years of pensionable service and had served in Britain, India, Hong Kong and South Africa. He was, however, not to repeat his father’s experience following discharge. Within nine months he was dead, killed by consumption of the throat. The illness must have struck rapidly and he died at the family home in Friar’s Terrace on 12 November 1906. The Cronins’ second child, Charles John (b. 1871) followed the family tradition pioneered by his Aunt Susannah and went into the Church. He attended St Austin’s School and did so well that in 1881 he was sent to the prestigious St Wilfred’s College, Cotton, in the north Staffordshire moorlands. This Catholic boarding school was famed for educating boys towards the priesthood, and that is the path followed by Charles Cronin. The priest at St Austin’s at that time was Canon John Hawksford who had previously been prefect of studies at Cotton College. He was instrumental in getting Charles Cronin a place there and the money to support him. In 1885 Hawksford went back to Cotton as President whilst Charles was a still a pupil, so the Stafford connection was strengthened. 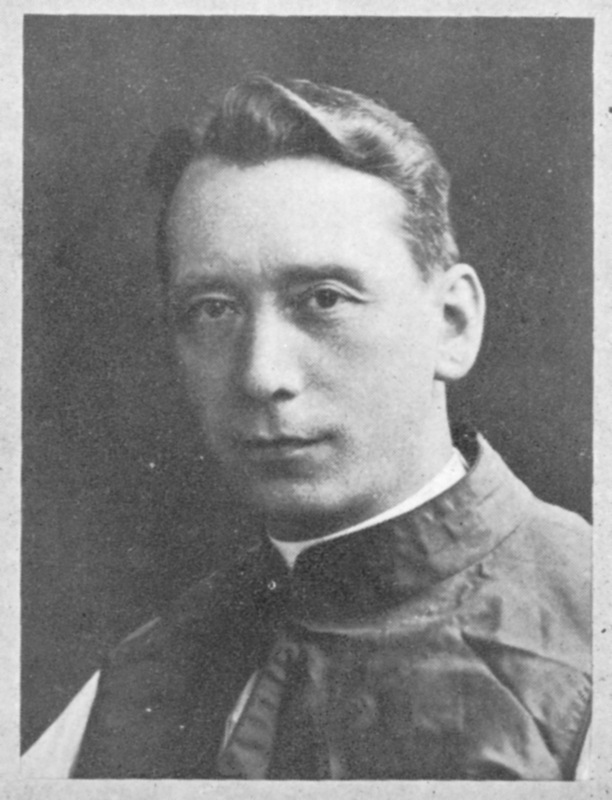 Charles Cronin’s career benefited from his family’s strong adherence to the Church which ensured the goodwill of teachers and clerics such as Canon Hawksford. The Cronins’ Catholicism was sustained by John Cronin and Robert Moyers’s Irish tradition but also by the Stafford Catholic tradition of the Follows family. Cronin’s whole career was demonstrably that of an English cleric moulded by experience in the international environment of Rome. Even though he reached high office in the Church, Charles Cronin did not sever his ties with either his family or his local Stafford Church. He came home when circumstances allowed and was in the town, for example, at the opening of St Patrick’s Church in 1895, the annual charity Mass for the SVP in 1908 and the golden jubilee of St Austin’s Church in 1912. The careers of Elizabeth and John Cronin’s daughters Catherine (b. 1873), Winifred (b. 1875) and Margaret (b. 1878) were more prosaic. The social life of all three women centred on the Church, and all are recorded organising and attending soirées and other Church functions. Winifred picked up amateur dramatics from her mother and, in 1915, took part in a ‘humorous play’ at a concert in aid of Belgian refugees. Catherine and Winifred stayed on at No. 4 Friars Terrace after their mother died in 1904. In 1901 Catherine worked as a dressmaker like her mother before her, but in 1911 had no stated occupation. She died in 1924 and her health may have been poor before that. In the 1900s Winifred was an assistant in a ‘fancy shop’, but her subsequent career is not known except that she never married, never left Stafford and died there in 1961. Margaret became a school mistress and taught for many years at St Patrick’s School. She also never married and died in Stafford in 1972. 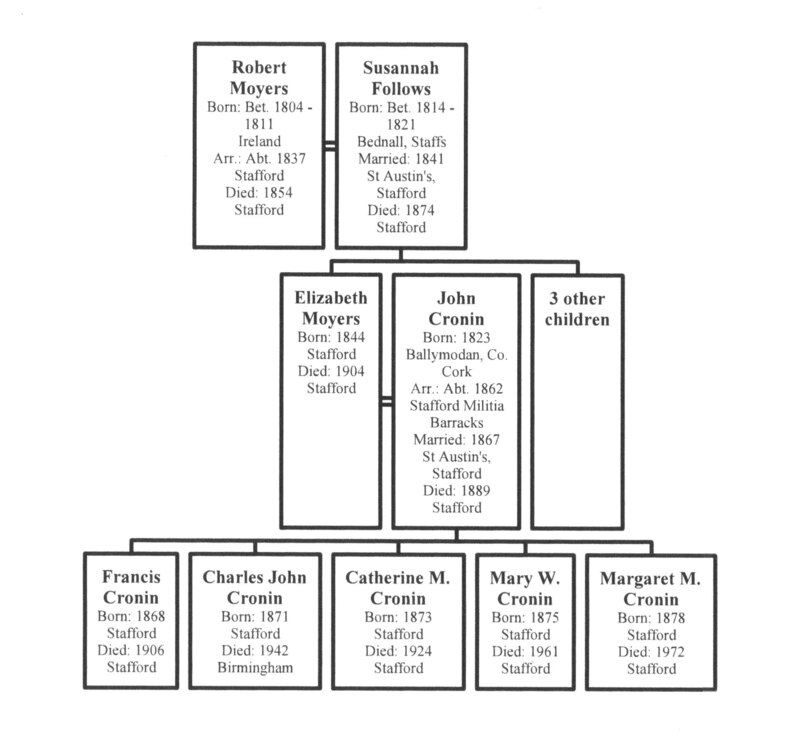 John and Elizabeth Cronin had five children but not one of them married. The reasons why the two sons remained single are obvious and for the daughters marriage and domestic drudgery may have been profoundly unattractive options. The Cronin sisters lived respectable, socially fulfilled and generally respected lives in Stafford, though it has to be said that one interviewee remembered the teacher Margaret from their schooldays and said she was ‘an evil old so-and-so’. What is remarkable is that when Margaret died in 1972 this family that had originated in the 1840s with Robert Moyers, and been consolidated in the 1860s with John Cronin died out completely. It had lasted over 130 years but had just three generations in that time. The Cronin family demonstrates how there is nothing inevitable about the process of family reproduction down the generations. Griffiths Valuation, Co. Tipperary, Co. Dublin and Co. Roscommon. 2 She has not been found in Britain in 1861 and 1871, and it is likely she was sent abroad. In 1881 and 1891 she was a nun at St Scholastica’s Abbey in Teignmouth, Devon, and died there in 1896. 3 National Archives, WO97/1584/129, No. 1733 Colour Sergeant John Cronin, FindMyPast Database accessed 25 January 2013. 4 Stafford Registration District (RD), Deaths, October-December 1874, 6b/15, Susannah Moyers. 5 Staffordshire Advertiser (SA), 8 August 1874. 6 SA, 6 April 1889, obituary of John Cronin. 7 E.g. SA, 29 December 1877, 26 February 1887, 1 April 1887, 21 April 1888, 9 March 1889. 8 SA, 6 April 1889, obituary of John Cronin. 9 Stafford RD, Births, October-December 1868, Vol. 6b 14, Francis Cronin. 10 NA, WO97/4611/172 No. 7810 Francis Cronin, Service Record, FindMyPast Database accessed 30 January 2013. Stafford RD, Death Certificate, 6b/7 No. 138, Francis Cronin . W. Greenslade, ‘Cotton College, formerly Sedgley Park School, in M.W. Greenslade, D.A. Johnson and C.R.J. Currie (eds. ), The Victoria History of the County of Staffordshire (VCH), Vol. 6, (Oxford, Oxford University Press for the Institute of Historical Research, University of London, 1979), pp. 156-8; F. Roberts and N. Henshaw, A History of Sedgley Park and Cotton College, (Preston, T. Snape and Co., 1985). W. Greenslade, St Austin’s, Stafford, 1791-1991, (Birmingham, Archdiocese of Birmingham Historical Commission, 1991), p. 28; http://www.freewebs.com/cottoncollege/ accessed 4 March 2013. The Catholic Herald, 9 January 1942, obituary of Charles Cronin. E. Williams, Oscott College in the Twentieth Century, (Leominster, Gracewing, 2001), pp. 48-9. The Catholic Herald, 9 January 1942. SA, 27 July 1895, 17 October 1908, 27 July 1912. Stafford RD, Deaths, April-June 1972, 9b/1070, Margaret M. Cronin.